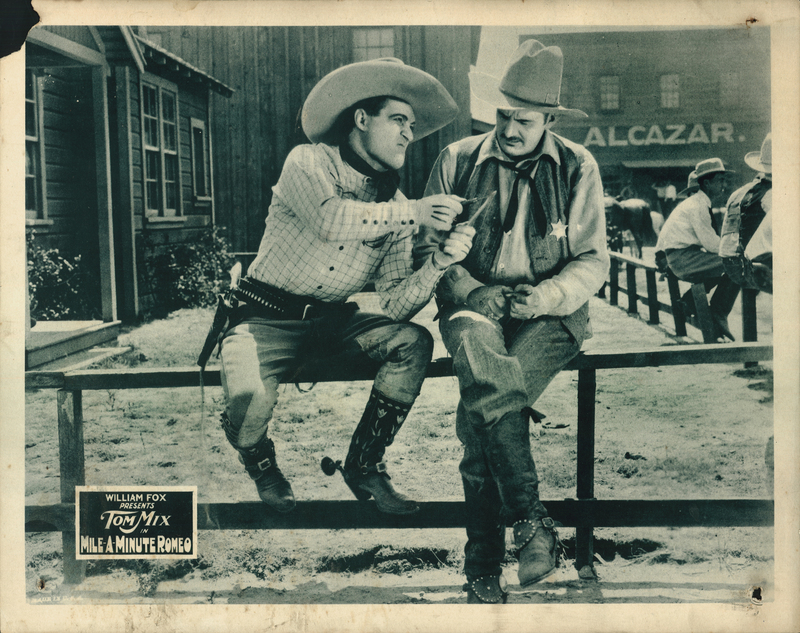 SCVHistory.com LW2772 | Film-Arts | Lobby Card: Tom Mix in 'Mile-A-Minute Romeo' (Fox 1923). Tom Mix stars as Lucky Bill in "Mile-A-Minute Romeo" (Fox Film Corp. 1923). Original blue-toned lobby card, 11x14 inches. According to Mix biographer Robert S. Birchard (1993:180), "Mile-A-Minute Romeo" was shot at various locations in the Los Angeles area. Production started July 24, 1923, and was completed Sept. 1, 1923. The film was released either Oct. 28 or Nov. 18, 1923. We don't know what locations were used; Mix was shooting in the Newhall area and Echo Park and elsewhere at this time. "Mile-A-Minute Romeo" comes on the heels of "Three Jumps Ahead," which was released earlier in 1923 and shot on location in Newhall. Curiously, "Alcazar," seen on the building in the background, was the name of Mix's ranch in Arizona (see below). We don't know if this scene was shot at his ranch, or if he merely used the name at another location. The director is Lambert Hillyer, who also directed several William S. Hart pictures. The scenario (screenplay) is by Robert N. Lee from a story ("The Gun Gentleman") by Max Brand. The cast includes Betty Jewel, J. Gordon Russell, James Mason, Duke Lee, James Quinn and Mix's horse, Tony, which is credited as "Tony the Horse" (and which Mix purchased in Newhall). Birchard (1993:181) notes that in this picture, Mix "performed most of his stunts with cameras close-on so audiences could see that he was doing them himself." Tony, however, was doubled. Description from Motion Picture News Booking Guide No. 6: "Western melodrama presenting the usual assignment of gun fights and thrills in which Tom Mix specialized. Lucky Bill falls in love with a girl betrothed to another. He takes matters into his own hands and the girl in his arms and rides away with her. She is finally won by his heroism and becomes a willing bride." St. Petersburg (Fla.) Times | April 12, 1928. 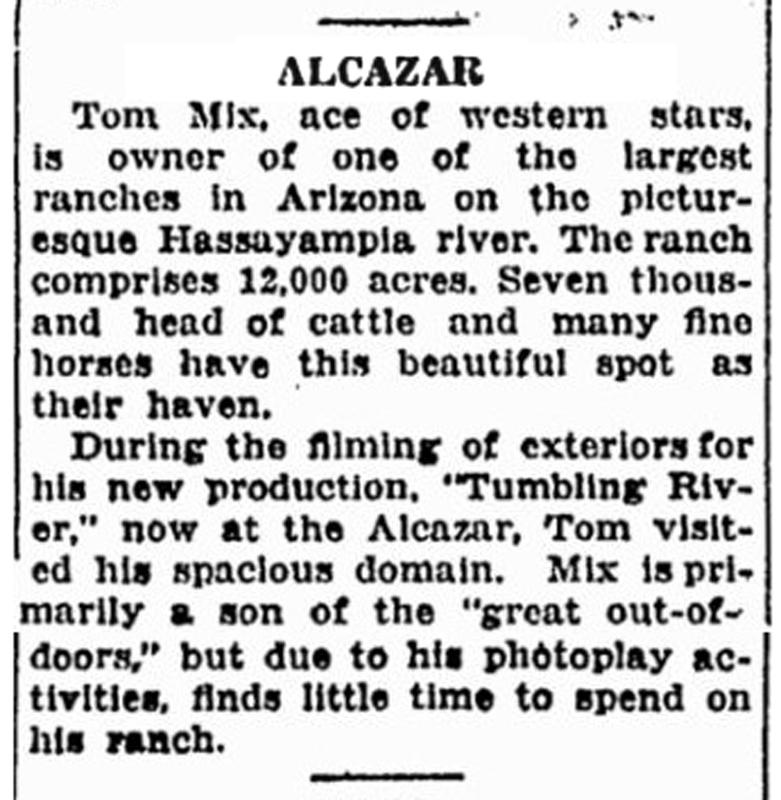 Tom Mix, ace of western stars, is owner of one of the largest ranches in Arizona on the picturesque Hassayampia [sic; Hassayampa] river. The ranch comprises 12,000 acres. Seven thousand head of cattle and many fine horses have this beautiful spot as their haven. During the filming of exteriors for his new production, "Tumbling River," now at the Alcazar, Tom visited his spacious domain. Mix is primarily a son of the "great out-of-doors," but due to his photoplay activities, finds little time to spend on his ranch. LW2772: 19200 dpi jpeg from original lobby card purchased 2015 by Leon Worden.